The winners of the 2018 Taurus World Stunt Awards were announced on Saturday, May 12, 2018 during a presentation at Paramount Pictures Studios in Hollywood, California. Stunt men and women from around the world honored their peers for a year of outstanding work in feature films. The films Wonder Woman and Atomic Blonde were the big winners for the night. Atomic Blonde won 2 awards, garnering Taurus awards in the Best Fight and Best High Work categories. The film was nominated 6 times. An 8 minute fight featuring the film’s heroine fighting men in a stairwell was a highlight of the film and earned the stunt performers Taurus awards. Wonder Woman won 2 Taurus awards, in the Best Overall Stunt by a Stunt Woman and Best Stunt Coordination and/or 2nd Unit Direction categories. The film Baby Driver won the Taurus for Best Work with a Vehicle for a car chase with bank robbers outmaneuvering the police. The Chinese film Wolf Warrior 2 took home the award for Best Action in a Foreign Film. 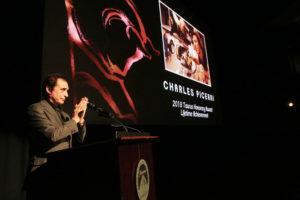 The Lifetime Achievement Award was awarded to Charles Picerni, an experienced stuntman, stunt coordinator and 2nd unit director. Charles’s big break came on the TV show Starsky and Hutch, where he started as the double for Paul Michael Glaser and the show’s stunt coordinator. He eventually became a 2nd unit director and director for the show. From there, Charles began stunt coordinating and 2nd unit directing films such as Die Hard, Die Hard 2, Road House, Lethal Weapon 2, Lethal Weapon 3, Christmas Vacation and Demolition Man. Charles continues to work in all aspects of the motion picture business and is currently developing and writing his own projects. It is our pleasure to congratulate the 2018 Taurus World Stunt Awards winners!